The Hotel Been to Bangkok countless times and SO Sofitel Bangkok has always been on my radar. I finally managed to check it out on my most recent trip, all in the midst of attending a Thai friend’s wedding. Urban chic, that’s how I would describe the five star SO Sofitel Bangkok the moment I stepped into the lobby located at level 9, centrally located in the heart of the city right beside Lumphini Park. The nearest public transport is Lumphini MRT station. Checking in at level 9 was a breeze as I was attended by the professional hotel staff, and was also served a complimentary welcome magic cocktail from the lobby’s bar. The lobby is also the space where guests can order a drink or two from the bar, as well as enjoy their Afternoon Tea, with full glass panes of the lush Lumphini Park. The Room One unique characteristic of the property is the segmentation of the rooms into four different fengshui inspired elements – Wood, Water, Earth and Metal. There are a few floors allocated to each element, and you can pick your preferred choice on the hotel’s website. Without much deliberation, my personal preference is the wood element room. I checked in to the SO Comfy room category, a spacious 38-45 sqm of comfort. The wooden touches here are predominantly light wood, which I feel creates a certain level of zenness for me. Each room in the property comes with a fully integrated Apple Mac mini media solution, and the So Comfy room also comes with complimentary private bar and coffee capsules for the illy espresso machine. After sleeping for two nights, my review is that the king size bed here is so comfy (pun intended). I also like that the pillow fits well into my head and I did have a good night sleep. If you are feeling lazy, you can trigger the button right beside the bed which draws down the window curtain automatically. Being a traveller with multiple devices, it also helps that there are multiple charging points in the room. Needless to say, the wifi is also complimentary with the room. The shower is also a luxurious space within the So Comfy room. You get to soak in a bath tub, or there is a separate standing shower cubicle which is spacious enough for one person, or more. Bathroom products are by Ytsara. The Facilities For the fitness geeks, level 10 will be your playground as it houses the SoFit gym and the infinity pool. The gym size is pretty decent, with a good range of cardio and weights equipment. 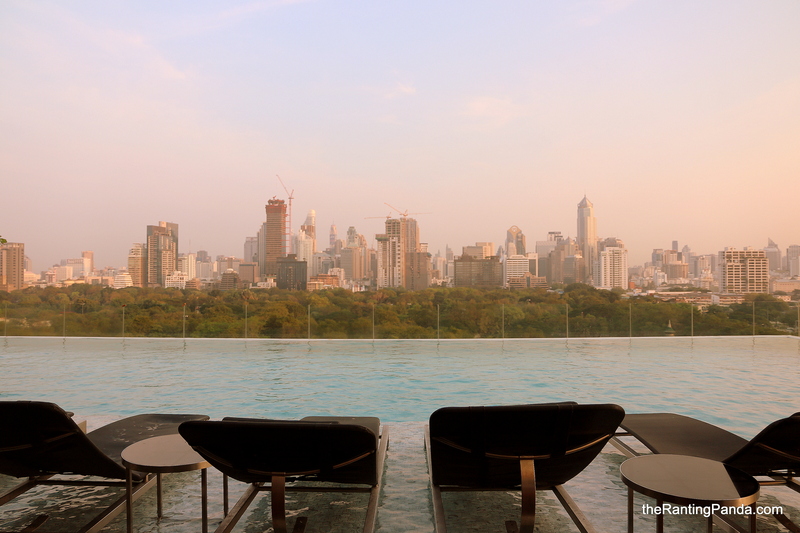 The pool overlooks Lumphini Park and the urban skyline, along with a small jacuzzi corner. The width of the pool is not that wide, so you may rub shoulders with other swimmers if you are considering some serious lap swimming. I also managed to have access to the Club Signature lounge on level 25 during my stay, which is a very chic looking space and probably my favourite spot in the property. The Club Signature serves complimentary daily Afternoon Tea bites from 1:30 pm to 3:30pm, followed by the evening Cocktail Hour from 4pm to 6pm. For Club guests, you can also opt to have your breakfast here if you prefer some peace and privacy. While it is unlike the extensive buffet spread as Red Oven, I feel that the selections from the ala carte menu and the buffet spread suffice for me. I also like the personalised service of the staff at the Club Signature, as they attempt to address you by your first name and also make the effort to take note of your personal food preferences, such as checking if my breakfast order is customised per my request after it was served. That is a nice service gesture in my opinion. The Restaurants Located at level 7, Red Oven is the all-day dining concept which is also the space for breakfast. The breakfast spread is a mix of local and international cuisine, with highlights like the egg stations, live noodle station, fresh juices and coconut, selection of pastries and even an ice cream corner. Otherwise, level 29 of the property houses Park Society, Modern Western Cuisine with a good dining view. There is also a rooftop bar adjacent to Park Society, HI-SO Rooftop Bar Bangkok which gives you a bird’s eye view of the surrounding Lumphini Park and beyond. The view is quite magnificent from the 29th floor and I do get a sense of that NYC Central Park vibes from certain angles. Rants Getting to malls or destinations beside the BTS is less convenient, as the nearest BTS station is Sala Daeng, approximately one km away or 20 minutes walk. Another gripe is that from street level, you will have to take a lift to level 9 of the main lobby, followed by changing to another lift lobby to get to your room. Overall Experience SO Sofitel Bangkok is one of the most luxurious Accor properties in Bangkok and is worth considering if you fancy a comfortable stay in your Bangkok trip. One thing I also notice is that the target market are mainly couples and adults, so you won’t get much of the screaming kids in the lobby or the pool, something I value in my choice of hotel these days. There are no lack of five star hotels in the city, but at least this is an affordable luxury for me. For more information, do check out SO SOfitel Bangkok Website. this should help my next trip to thai.. hope its not expensive..
You can consider this property!